I finally updated the blackboard in the kitchen and have thus stopped urging people to have a happy Easter. 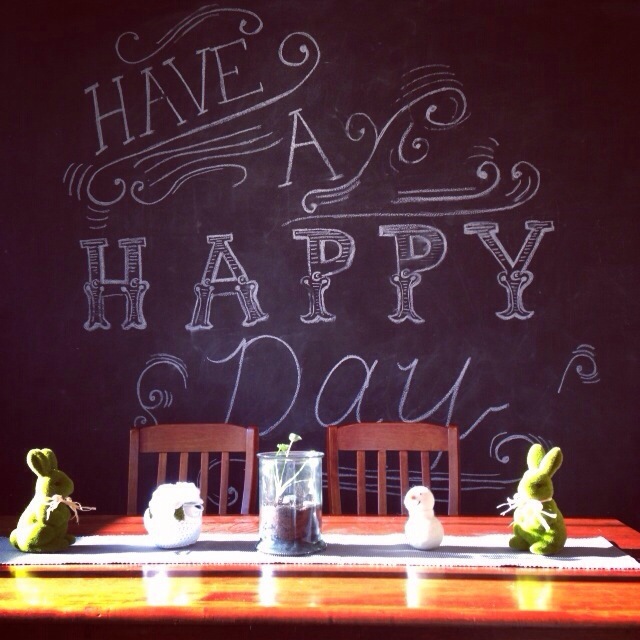 Now, through the medium of chalk, I’m encouraging people to have a happy day. Much more generic and timeless. The grass bunnies remain though. 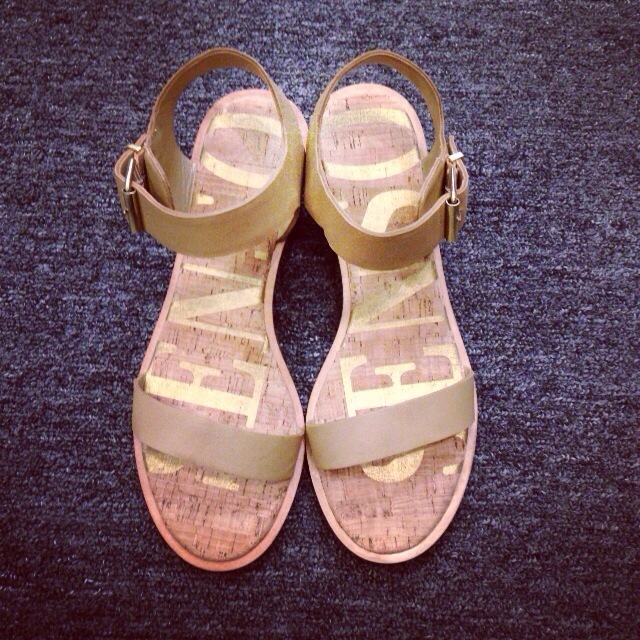 Speaking of happy, it’s hard not to be when you purchase a pair of $200 sandals for $20. Even in winter. Puppies are possibly the happiest and most happy-inducing creatures on the planet. I got to cuddle my friend Dylan’s new puppy yesterday. His name is Ned. The name Ned doesn’t make me think of Ned Kelly or Ned Flanders. It makes me think of a friend I had when I was very young who undoubtedly had some kind of undiagnosed behavioural disorder. One time he abseiled off the second story balcony at home using an extension cord tied to the leg of his bed. Oh Ned. This weekend I embraced the mundane. I washed my car, bed sheets and towels. I put away all my clothes. Went for a run. And to the gym. I read my book. Went to the movies (Jersey Boys, not bad) and had a quick dip in my friend’s spa. I had eggs for breakfast at a local cafe. I broke my three day old shopping ban and bought jeans (blue). And a jumper (black and white striped). Both on sale. I drank tea. And ate chocolate. I’m going to have Deconstructed Rice Paper Roll Salad for dinner, followed by an early night. What was the happiest or most mundane thing you did this weekend? 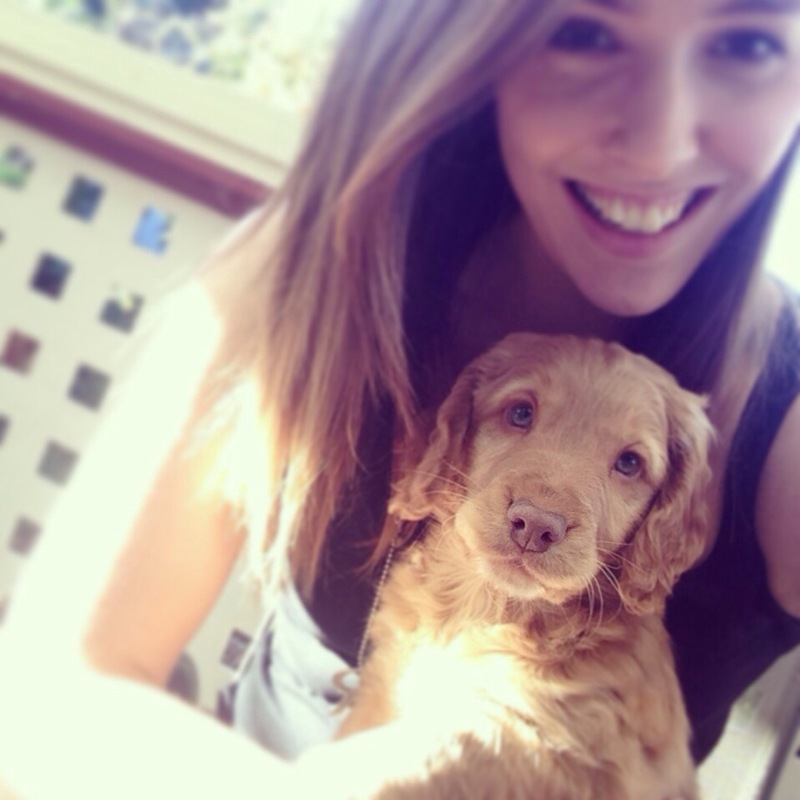 This entry was posted in Misc and tagged Puppy, Shopping, The Weekend. Bookmark the permalink. I probably should have done all those (cleaning) things, oh well! Which magazine? Limelight, The ABC arts, music and culture magazine. Its a great escape for a couple of hours. Its one of the best music, art and literature magazines on the market. But you are excused because of Angus and the NYT article on Owen.